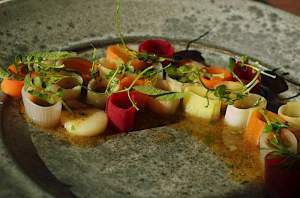 Ranked the ‘42nd best restaurant in the world in 2014’ by the Restaurant Magazine, Geranium is one of the Copenhagen’s two-star Michelin restaurants, run by Rasmus Kofoed, who was entitled as the World’s Best Chef in 2011. Geranium is a sober, balanced and a lively restaurant, with an aim to restore, challenge and enrich all the senses, through the flavors of the food it serves. This north-European kitchen, which gives Noma-“the best restaurant in the world”, a run for its money, is located on the eighth-floor in Faelledparken in the Osterbro area of Copenhagen. The location emphasizes its vision of gastronomic clarity and mélange. Interior of the restaurant is characterized by the world-renowned Danish design with clear lines, minimal adornments, in-vogue furniture and a monochromic theme to keep the attention of the guests glued to the plates. During the day, the place is well-lit due to the illumination by the bright sunlight. The entrance is dramatically lit-up by the gas-fired torches; the guests are promptly greeted and are then escorted to the cocktail tables. The sight of the team working in a fluid way, in silence is quite impressive and worth watching, since the guests can peek inside the partially-closed kitchen through a glass wall. Modern cuisines are too driven by techniques, but the references at Geranium were easy to understand. It has a 14-course Nordic cuisine tasting menu right from the ‘seaweed potato chips’ to the last one being the ‘mignardises with coffee’. 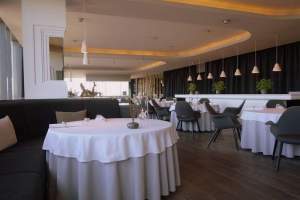 The guests are asked (if they wish to) to enjoy their pre-dessert in the kitchen, on the special tables at the back of the room, facing the workstation to observe the action-in-kitchen. Each dish that is presented has a wow-factor in it, with flavors that are fresh, seasonal and colorful, delivering a sense of deep satisfaction. The creativity in the presentation is impeccable and does not appear to be overdone. Further, Geranium is known to have one of the best wine and juice pairings. In fact, a vegetarian menu and individual courses are also on offer with wine or juice pairings, for an extra charge. Geranium keeps knowledgeable and properly attentive waiting staff, making the service impeccable, efficient and courteous, with the correct degree of informality. It is a great place to enjoy the local cuisine with the best possible service. There is no such problem with reservations in the restaurant, and one can easily dine-in at a short notice. All-in-all, it is a value-for-money experience. Pay your visit to GERANIUM, when on a trip to Copenhagen to savor the dishes which have a consistent, well-balanced and harmonious taste and we assure you that it would take a very long time for any other meal to top the incredible culinary experience at Geranium.